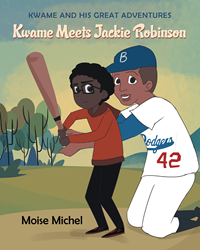 Recent release “Kwame and His Great Adventures: Kwame Meets Jackie Robinson” from Page Publishing author Moise Michel is an encouraging children’s book featuring Kwame and the lesson he learns about perseverance from one of the most famous baseball players of all time. Moise Michel, a second-time author, journalist, and passionate writer, has completed his new book “Kwame and His Great Adventures: Kwame Meets Jackie Robinson”: a potent and heart-warming story of Kwame’s frustration and triumph as he discovers someone like himself who faced rejection but continued to strive toward being the best player on the team. Published by New York City-based Page Publishing, Moise Michel’s engaging tale showcases Kwame’s journey into the past where he finds the answers he needs to help deal with his disappointment and continue forward despite his failure. Disheartened with his unsuccessful attempt to make the school baseball team, Kwame finds himself accidentally transported by his own watch invention back in time. He meets one of his favorite historical figures who teaches him a valuable lesson in overcoming challenges despite what people think. Readers who wish to experience this uplifting work can purchase “Kwame and His Great Adventures: Kwame Meets Jackie Robinson” at bookstores everywhere, or online at the Apple iTunes store, Amazon, Google Play, Kobo or Barnes and Noble.